Soak lemons in tap water and baking soda for 10 minutes. Rinse well several times and pat dry. Peel the lemons as closely as you can, using a curved paring knife to remove any white thread-like pith, which is too bitter and can spoil the outcome. Save the peel for this recipe and use the lemons for granita, juice or other applications. For limoncello, all you need is the rind. Soak the lemon peels in a large tightly closed (even plastic wrap can do) glass or ceramic carafe or tall jar with the alcohol to macerate for 48 hours in a cool, dry place. The rinds will become brittle through this procedure, extracting all their fabulous essence into the spirit. On the final day, in a large stewpot, bring the mineral water with the sugar to a boil. When the sugar is completely dissolved, cover and remove the pot from the stove and allow your syrup to cool to room temperature. When the 48 hours are up, strain the alcohol with a close mesh gauze or double cheesecloth, discard the peels and pour the filtered alcohol in the syrup in one single, steady splash. This will ensure opacity to the blend. Transfer the resulting bright yellow, cloudy liqueur in individual glass bottles (makes about 2 liters, or a half gallon). Close each firmly with a natural cork stopper and wait until completely cool before storing in the freezer. On each bottle proudly apply a handwritten label that reads “limoncello made by me”. Serve chilled in small frosty shot glasses and revel away. I serve my homemade Limoncello in lovely mini chocolate shot glasses, it makes my guests so much happier! Only a few days left to vote this authentic recipe from Sorrento!! Go ahead and improve my chances of being published in The Foodista Best of Food Blogs Cookbook! Italy’s most famous after dinner liqueur. I like mine tart, zesty, not too sugary, ice cold and dreamy. 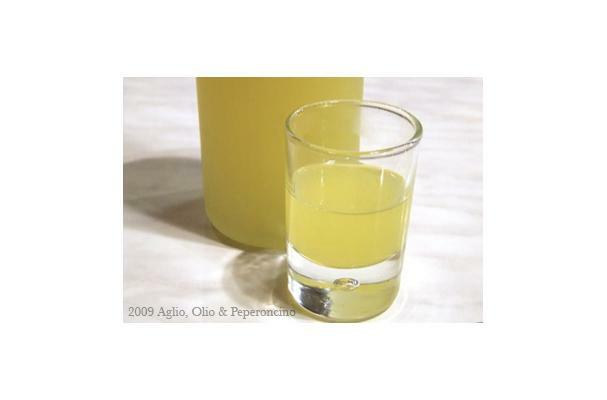 This is the original recipe from Sorrento, the birthplace of Limoncello. Grain alcohol (Ethanol) is available at concentrations of 95% alcohol (190 proof) and 75.5% (151 proof). It is illegal to sell the 190-proof variety in some states of the U.S., including California, Florida, Hawaii, Illinois, Maine, Massachusetts, Michigan, Minnesota, Nevada, New York, Ohio, Pennsylvania, Virginia, and Washington. In some of these states, the 151-proof variety may be sold. In Canada, it is not sold in Saskatchewan but is available in Alberta. The British, Australian and New Zealand retail policies are, like in Europe, quite lenient as far as ethanol is concerned.